Ebel Artistry was written up in Travel & Leisure as one of the best beauty spots in town! Whats in your Make- up Bag? 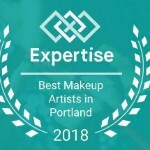 Oregon Environmental Council - Make sure your Beauty products are Healthy!